187 Beacon is located on the south side of Beacon, between Berkeley and Clarendon, with 185 Beacon to the east and 189 Beacon to the west. 187 Beacon was built ca. 1866 for real estate dealer Henry Whitwell, one of two contiguous houses (187-189 Beacon) built as a symmetrical pair but with 187 Beacon seven feet wider than 189 Beacon. Henry Whitwell bought the land for 187-189 Beacon on November 14, 1862, from Lucius Manlius Sargent, who had purchased it from his father, Horace Binney Sargent, on June 14, 1861. It was part of a larger parcel Horace Sargent had purchased on March 10, 1860, from Norman Munson, who had acquired it from the Commonwealth of Massachusetts on March 7, 1860. Norman Munson and his partner, George Goss, were the contractors responsible for filling the Commonwealth’s Back Bay lands. Click here for an index to the deeds for 187 Beacon. Appendix A of Bainbridge Bunting’s Houses of Boston’s Back Bay indicates that 187-189 Beacon were built by James W. Tobey and John F. Farrington, both housewrights. This appears to be an error. James Tobey and John Farrington built 197-199 Beacon (as also indicated by Bunting) but do not appear to have been associated with 187-189 Beacon (although they may have been the builders hired by Henry Whitwell to construct the houses). On February 25, 1870, 187 Beacon was purchased from Henry Whitwell by Frank William Andrews. He and his wife, Maria Frances (Adams) Andrews, made it their home. They previously had lived at 6 Marlborough. Frank Andrews was a former importer of iron and, later, crockery. He had retired at an early age to manage his real estate investments. The Andrewses also maintained a residence, Sunset Ridge, in Newport, designed by H. H. Richardson and completed in 1873. They continued to live at 187 Beacon until about 1891, when they moved to Washington DC. He continued to own the house and lease it to others. During the 1891-1892 winter season, 187 Beacon was the home of William Sumner Appleton and his wife, Edith (Appleton) Appleton. They previously had lived at 317 Dartmouth. Educated as an attorney, William Sumner Appleton never practiced law, but devoted himself to the study of history, numismatics, heraldry, and genealogy. He designed the seal for Harvard which was adopted by the Harvard Corporation in 1885. William and Edith Appleton lived at 187 Beacon while the new home they were building at 462 Beacon was being completed. Edith Appleton died in January of 1892, before the new house was finished. William Appleton moved there upon its completion. 187 Beacon was not listed in the 1893 Blue Book. By the 1893-1894 winter season, it was the home of iron merchant Isaac Lowell Pratt and his wife, Emily (Cutter) Pratt. They previously had lived in Brookline. 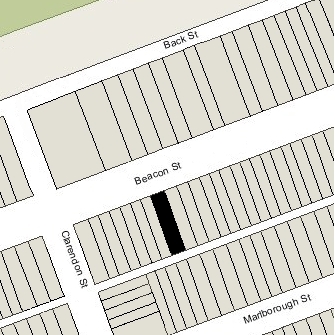 They continued to live at 187 Beacon during the 1895-1896 winter season, but then moved to 120 Marlborough. 187 Beacon was not listed in the 1897 and 1898 Blue Books. By the 1898-1899 winter season, 187 Beacon was the home of attorney Ebenezer Gay and his wife, Ellen Blake (Blood) Gay. They previously had lived at 169 Beacon (their son, Eben Howard Gay, had married in December of 1898 and kept 169 Beacon as his home). Their son, notebroker William Otis Gay, and Ellen Gay’s unmarried sister, Elizabeth R. Blood, lived with them at 187 Beacon. Ebenezer Gay died in April of 1899. Ellen Gay continued to live at 187 Beacon until about 1902, but by 1903 had moved to 170 Beacon to live with her son, Eben Howard Gay. William Otis Gay and Elizabeth Blood continued to live at 187 Beacon (Elizabeth Blood had moved to 170 Beacon for the 1901-1902 winter season, but moved back to 187 Beacon thereafter). William Gay married in April of 1905 to Annie Margaretta Dumaresq. They continued to live at 187 Beacon after their marriage. Elizabeth Blood lived with them until her death in December of 1907. In 1909, Eben Howard Gay sold 170 Beacon. Ellen Gay moved back to 187 Beacon to live temporarily with William and Annie Gay, but by 1911 had moved to an apartment at 186 Commonwealth to live once again with Eben Howard Gay. William and Annie Gay continued to live at 187 Beacon during the 1915-1916 winter season, but moved thereafter to New York City. The house was not listed in the 1917 Blue Book. On March 16, 1917, 187 Beacon was purchased from the Andrews family by Dr. Charles Galloupe Mixter, a physician and surgeon, and his wife, Helen Worthington (McIntosh) Mixter. They previously had lived at 247 Beacon. He maintained his medical practice at 180 Marlborough with his father, Samuel Jason Mixter, and his brother, William Jason Mixter. During the 1918-1919 winter season, Charles Mixter was serving with the American Expeditionary Forces in France and Helen Mixter was living in an apartment at 308 Commonwealth. 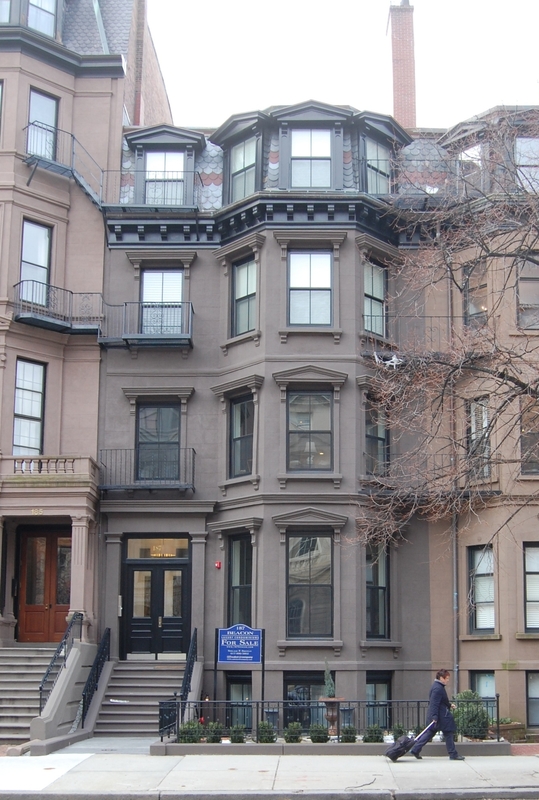 During the season, 187 Beacon was the Boston home of William Samuel Patten and his wife, Anna Morton (Thayer) Patten. He was a Captain in the US Army and assistant military attaché to the American embassy in London. They also maintained a home in Lancaster. They had moved by the 1919-1920 season, and by the 1920-1921 season were living at 234 Beacon. The Mixters had resumed living at 187 Beacon by the 1919-1920 winter season. In about 1923, Charles Mixter’s father retired from practice and William and Charles Mixter moved their offices to 270 Commonwealth. 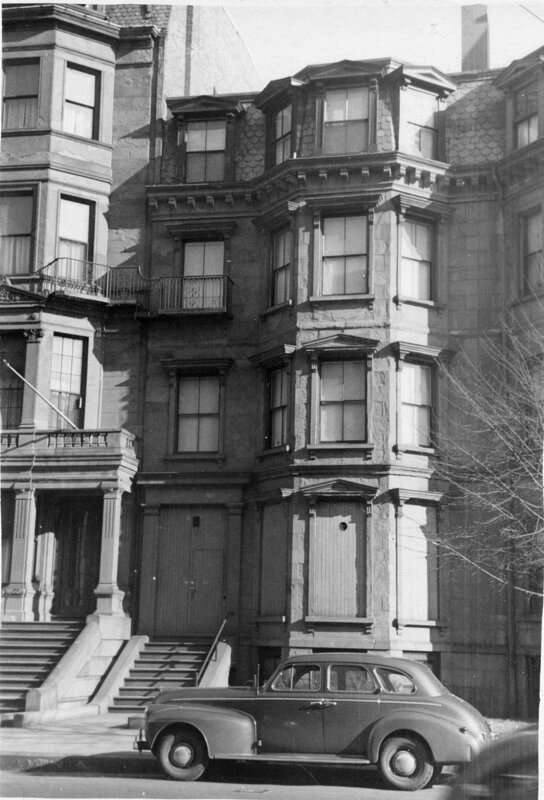 Charles and Helen Mixter continued to live at 187 Beacon in mid-1924, but by 1925 had moved to Brookline. During the 1924-1925 winter season, 187 Beacon was the home of Benjamin Helm Bristow Draper and his wife, Queena (Sanford) Draper. He was a manufacturer of cotton mill machinery in the firm founded by his grandfather, located in Hopedale, where they also maintained a home. They had lived at l75 Mt. Vernon during the previous season and at 138 Beacon in 1923. By the 1925-1926 season, they had moved to 181 Commonwealth. On May 15, 1925, 187 Beacon was purchased from Charles and Helen Mixter by real estate dealer James M. Burr. The same day, he entered into a mortgage on the property and then transferred it to real estate dealer Albert Geiger, Jr., and his wife, Gertrude D. (Rueter) Geiger, who assumed the mortgage. The Geigers made it their home during the 1925-1926 winter season. They previously had lived in an apartment at 68 Commonwealth. By the 1926-1927 season, they had moved to an apartment at 5 Arlington. On November 23, 1926, stockbroker Henry G. Lapham acquired the mortgage entered into by James Burr. By the 1926-1927 winter season, 187 Beacon was leased by William Jay McKenna and his wife, Isoline Orne (Campbell) McKenna. They previously had lived in West Newton. He was president of Henry Woods Sons Company, makers of dry colors. On February 7, 1927, the Suffolk County Sheriff took possession of 187 Beacon under a writ issued by the Superior Court for recovery of a debt owed by Albert Geiger, Jr., to John Valentine Dittemore. The property was sold at public auction on May 7, 1927, and John Dittemore was the successful buyer. John Dittemore was a retired Indianapolis meat packing executive who came to Boston to work in the Christian Science Church; he also owned and developed real estate and, in 1927, he and his wife, Edith Louise (Bingham) Dittemore lived at 45 Commonwealth, which they had converted to apartments in 1924. On May 28, 1929, John Dittemore’s interest in the property was acquired by Henry G. Lapham, who continued to hold the mortgage as well. The McKennas continued to live at 187 Beacon in during the 1929-1930 winter season, after which they moved to New York. By 1932, they were living at 13 Gloucester. On October 23, 1930, Henry Lapham foreclosed on the mortgage he held from James Burr and took possession of the property. On the same day, 187 Beacon was acquired from Henry Lapham by William Osgood Taylor and his wife, Mary (Moseley) Taylor. They previously had lived at 276 Beacon. They also maintained a home in Buzzard’s Bay. William O. Taylor was publisher of the Boston Globe. He had succeeded his father, Charles Henry Taylor, who had published it from 1873 (one year after its founding) until his death in 1921. William Taylor remained the publisher until his death in 1955, after which he was succeeded by his son, William Davis Taylor. Mary Taylor died in May of 1944. William Taylor moved soon thereafter to 5 Exeter to live with their daughter, Elizabeth (Taylor) Crowninshield, the former wife of Benjamin Davis Crowninshield. On July 28, 1944, 187 Beacon was purchased from William Taylor by Fannie (Siegel) Brown Silverman. She and her husband, Jacob William Silverman, lived in Haverhill, where he was a real estate dealer. 187 Beacon became the home of the Silvermans’ son and daughter-in-law, Alfred Saul (called Saul) Silverman and Louise Bernice (Siskind) SIlverman, who had married in November of 1943. Saul Silverman’s sister, Helene (Helen Anna) Silverman, lived with them. They operated 187 Beacon as a lodging house. Helene Silverman married in 1946 to Richmond Israel Bailen, an attorney. After their marriage, they lived at 187 Beacon. Saul and Louise Silverman continued to live there until about 1948. Richmond and Helene Bailen continued to live there until about 1952. In February of 1954, Fannie Silverman applied for (and subsequently received) permission to convert the house from a single-family into a single-family and lodging house, legalizing the current occupancy. On September 15, 1959, 187 Beacon was acquired from Fannie Silverman by Nubar K. Dinjian. In November of 1959, he applied for (and subsequently received) permission to convert the property into ten apartments. The building subsequently changed hands, remaining an apartment house, and on September 7, 2011, was purchased by the 187 Beacon Street LLC. 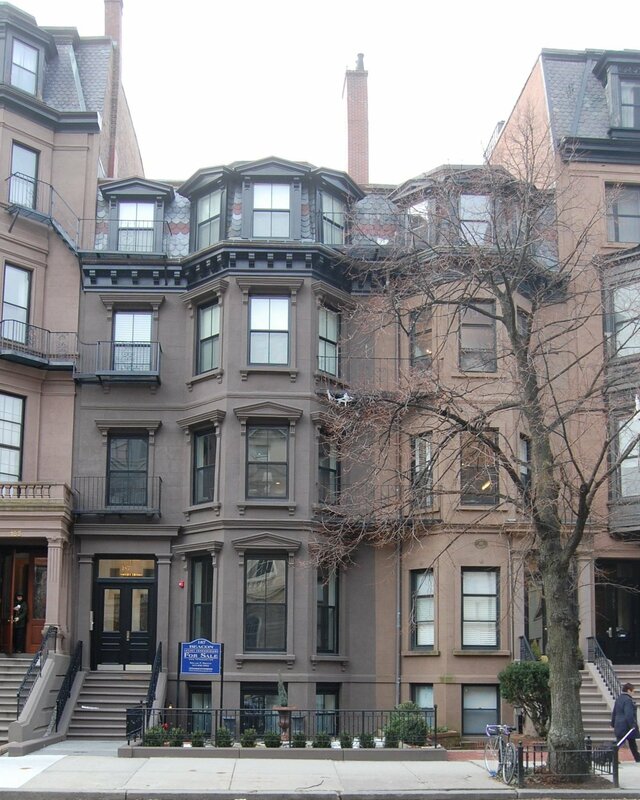 On May 12, 2014, the 187 Beacon Street LLC (Damian McNulty, manager) converted the property into four condominium units, three dwelling units and one garage unit, the 187 Beacon Street Condominium.